← 2016 Kuurne-Brussels-Kuurne Preview – Will Kristoff Conquer Kuurne? Despite Tuesday’s terrorists attacks, the 71st edition of the semi-Classic Dwars door Vlaanderen looks as if it take place tomorrow as planned (until we hear otherwise). While top contenders for the cobbled Monuments often skip this mid-week semi-Classic, plenty of other talented riders still make the trip to Roeselare, where 200km of cobbles and climbs offer them a chance to reacquaint themselves with the terrain many of them haven’t seen since the Belgian opening weekend, and some since last season. Without galaticos like Cancellara, Sagan, and Boonen taking part, Dwars is a great place for unsung heros and upstarts to try and shine. Case in point: Jelle Wallays won last year’s race for Topsport Vlaanderen-Baloise, proving that his win in the previous year’s Paris-Tours was no fluke (and earning himself a World Tour contract with Lotto-Soudal). Here are the five riders I think have the best chance to take the victory tomorrow, along with a handful of other men to keep your eye on. Terpstra’s won this race twice (2012 and 2014), but both of those victories came while the Dutchman was still considered more of a lieutenant than a captain. But now he’s a former winner of Paris-Roubaix and the runner-up in last year’s Tour of Flanders, meaning no one will overlook him as one of the event’s top contenders (especially wearing the jersey of the Dutch national champion). I’ve long been of the belief that a rider needs to finish Milan-Sanremo in order to be a contender for the cobbled Classics, but Terpstra’s proof that this isn’t always the case. He last raced la Primavera in 2013, a spring in which his best result in the cobbled Classics was a third-place finish in Paris-Roubaix. But in 2014 he skipped the Italian Monument, yet still won both Dwars and Roubaix. Last year, he skipped it again, and still managed to score a string of high finishes including his second-place finish in the Ronde. Whether he wins tomorrow or not, expect Terpstra to be a major protagonist, especially on a team that also boasts Fernando Gaviria and Yves Lampaert, both riders who should benefit from the attention Terpstra will draw—not to mention his experience. Despite being everyone’s favorite future superstar, Lotto-Soudal is clearly taking it easy with young Benoot. Last year, if you recall, Benoot rode neither Paris-Nice nor Tirreno Adriatico before the Flemish Classics—his pre-Dwars program consisted of the Driedaagse van West Vlaanderen and a series of one-day races in Belgium and the Netherlands. This year he raced Strade Bianche and Tirreno, which is perhaps why he skipped Milan-Sanremo this past weekend. Benoot’s still winless as professional and the only question mark surrounding his potential regards his ability to come through at the end. Fresh and eager to race, Dwars is a great chance for him to take his first big win. Benoot’s arrival has overshadowed the continued development of Jens Debusschere, who’s perhaps easier to miss now that he’s not wearing the Belgian Driekleur trikot. Eighth here last year, Debusschere’s pre-Dwars program has been nearly identical to last year’s with one key exception: he finished Saturday’s Milan-Sanremo (he skipped it entirely last year). While Milan-Sanremo’s 300km will certainly benefit the 26-year-old in Ghent-Wevelgem, the Tour of Flanders, and Paris-Roubaix, they might hurt him here. If he doesn’t need Wednesday to work out any remaining kinks from Saturday, he’s a perfect rider for a race like Dwars in that he can win from a breakaway and by out-sprinting a diminished peloton. Last year’s runner-up as a member of the ever-dependable Topsport Vlaanderen-Baloise team, Theuns is primed for his first big win tomorrow. An eighth-place finisher in both the Omloop and Kuurne, Theuns then went to Paris-Nice, where he came tantalizingly close to winning Stage 1. Theuns should be the focal point of a Trek-Segafredo squad riding without Fabian Cancellara, who traditionally skips Dwars to be at his best for Friday’s E3. Like Debusschere but maybe better, he’s a rider who can win in a variety of ways. With Jasper Stuyven and Stijn Devolder alongside the 24-year-old, Trek-Segafredo could be the team to beat. 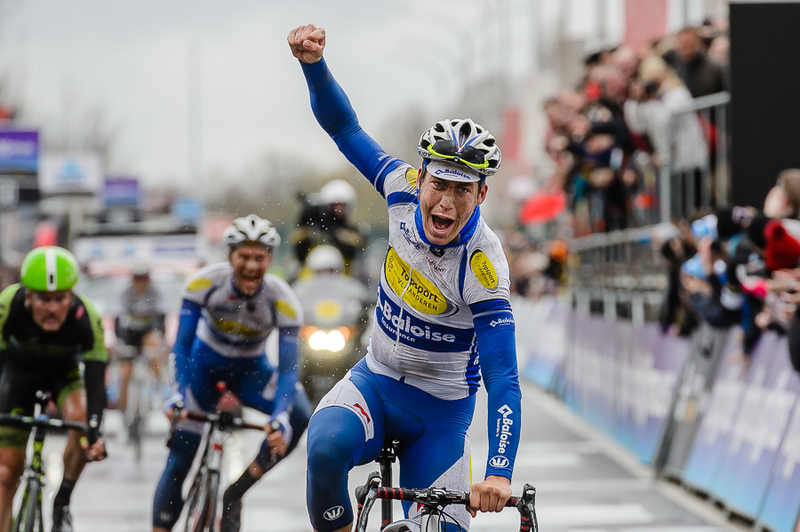 Gatto won Dwars in 2013 and looks primed for another high finish this year. With Peter Sagan not racing, the 31-year-old Italian is free to ride for himself in a race he knows well. He’s healthy, in-form, and should have no problems finding his way into the winning move. Etixx-Quick-Step’s Fernando Gaviria will be hoping it all comes down to a sprint—and that he manages to stay upright for it. His teammate Yves Lampaert should be given a chance to try his hand in a breakaway or two, especially with teams marking Terpstra and Gaviria scaring them away from bringing the race back together…Jens Keukeleire will be the focal point of Orica-GreenEDGE’s attack, while Dries Devenyns will lead the way for IAM Cycling…Ag2r’s Alexis Gougeard was one of the heroes from the Omloop. The Frenchman did his best Jacky Durand impression by going in the day’s long breakaway yet still hanging-on to finish fifth…In the event of a field sprint, it’s hard not to like the chances of Direct Energie’s Bryan Coquard…Don’t be surprised if Stölting Service Group’s Gerald Ciolek uses Dwars as a chance to remind everyone that’s still got something left in the tank…And last but certainly not least, we can no longer discount the chances of Southeast’s Pippo Pozzato, as evidenced by his eighth-place finish in Saturday’s Milan-Sanremo (though I suspect he’s treating tomorrow more as training). Theuns goes one better than last year’s edition, winning Dwars door Vlaanderen ahead of Marco Marcato and Jens Debusschere. Share your picks and comments below. This entry was posted in Featured, Races. Bookmark the permalink.